Join the #1 Content Locking Network and increase your earnings from your premium content! Content Locking allows you to monetize your online traffic easier and more effectively than any other ad service. Our Content Lockers can be seamlessly integrated into apps, websites, blogs, games, & more with ease. Earn the profit you deserve from your web and mobile traffic! What Can You Content Lock? *You must own the copyrights to all content you lock! Our mobile content locker automatically displays when a mobile device is detected. Offers are targeted to the user's device and country to maximize performance. Mobile traffic usually converts better than desktop traffic since our mobile-friendly offers have an easier user flow. Mobile content lockers can also be fully customized with HTML/CSS flexibility and other features! 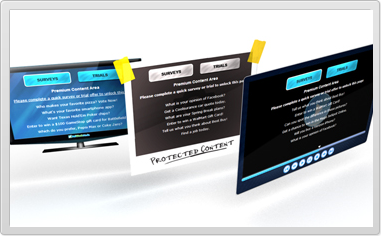 AdWork Media's Content Locking technology is a proven solution for monetizing nearly all types of web content & traffic. Content Lockers can easily outperform profits from PPC and display advertising models! How Does It Work? » Our flexible Content Lockers can be integrated with nearly any monetization style, although the most popular choice is to greet the user immediately with our widget as they access your content. The Content Locker will fully "take over" the page and require the user to complete a brief action from our sponsors such as a download, email submit, short survey, or product trial in order to continue. 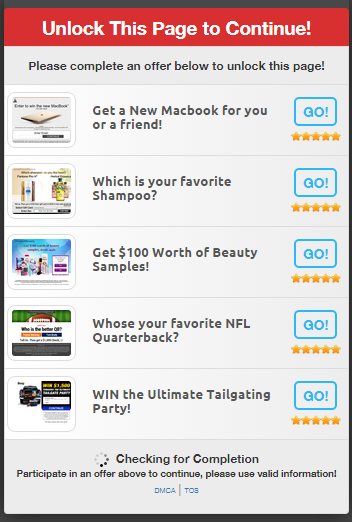 You profit each time the user participates in a sponsor's offer. Upon completion, the page will restore normal access or redirect to another URL of your choice with our automatic real-time tracking. Get Content Locking in minutes with our pre-made themes! Our flexible Content Locker Manager allows you to customize appearance & theme settings, monetization options, and advanced behavior settings. Set the redirect URL, user access time, campaign types, and an endless amount of other options. You're the boss! All Content Locker campaigns have been handpicked and are optimized for Content Locking traffic. Monetize traffic from nearly every country and any device while maximizing your EPC and overall earnings. We've mastered the recipe to converting Content Locker traffic! Content Lockers can be used with our postback tracking services for full integration into websites, apps, games, and software. Use tracking ID's to pass variables (ex: user ID's) back to your platform and execute your own business logic for each successful completion that generates commission. Content Lock like a pro with our advanced features and detailed reporting, including Impression Tracking, Auto INTL Translation, and full Conversion Statistics. Further improve your conversion rates by optimizing variables with our Split Testing tools. Can I Monetize Mobile Traffic with My Content Locker? Yes! Our Content Locker tool is mobile optimized and automatically detects mobile devices. It can support traffic from all devices and will automatically target our best converting offers for the user's device such as iOS and Android campaigns. How Does Content Locking Work? How Much can I Earn with the Content Locker? You can typically earn $0.20 to over $20.00 per valid conversion depending on the user's country and device. Average conversion rates usually vary between 5%-10% so earnings can add up very quickly. Your overall earnings and performance will depend on the quality of your traffic and the content that you are monetizing. Does the Content Locker Support International Traffic? Yes! AdWork Media's Content Locker tool supports traffic in over 200 countries. We can fully support traffic from international countries. Offers will always be displayed to your users in their local language. Explore additional documentation in our Content Locker Overview PDF. AdWork Media's support team is happy to help you integrate content locking into your site or app! Please also feel free to contact us with any questions to help you get started with content locking!